Different kinds of room accents drift in and out of style, but there’s one form of accessorising that will never lose its allure – the age-old floral arrangement. Perfect for any room of the house, well-chosen blooms – whether faux or real – will lift your interior instantly. A combination of the right flower type and the ultimate vase can really amplify your chosen aesthetic. Not sure whether to channel modern cool (à la Jean-Louis Deniot’s super-slender tabletop selection) or to go big and bright? We round-up seven inspiring ways to welcome flowers into your home. There is really no better way to be greeted when you enter your home than by an exquisite display of flowers. And, for this reason, the hallway is one of the most effective places to show off an arrangement. Something colourful and striking will always make a conversation-starter as soon as guests step inside your home. This space by Helen Green Design shows how to take advantage of high ceilings. A mix of green and purple hydrangeas, guelder roses and dahlias add up to a tall, full bunch that can be admired on ground level, whilst walking up the elegant staircase, and from above. Take note of the vase: a sculptural silhouette adds edge to the pretty display while a neutral palette allows the flowers’ hues to do the talking. A dining table is a perfect platform for your finest lot of flowers. A round table looks incredible when styled with a single centrepiece, while longer designs can be beautifully accentuated with multiple vases. This serene setting by 1508 London is a reminder of the power of three rule. 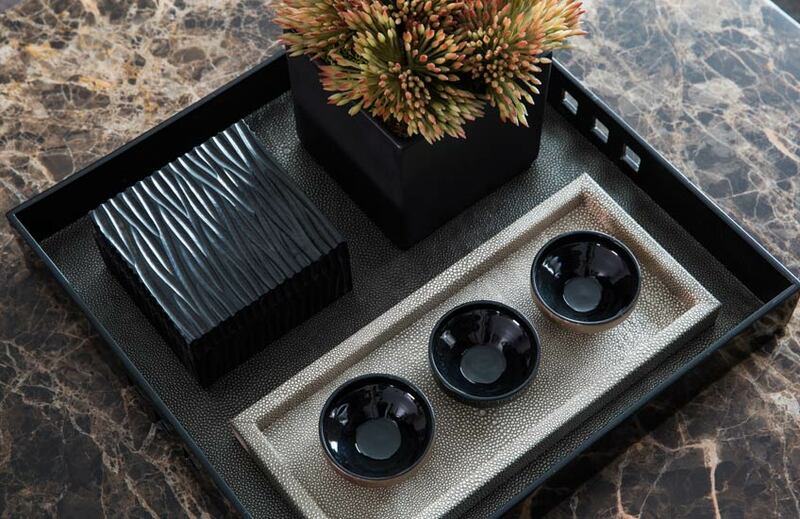 Parading a catwalk that comes in the form of neutral runner, a trio of dark vases make a sophisticated line-up for this dining room table. 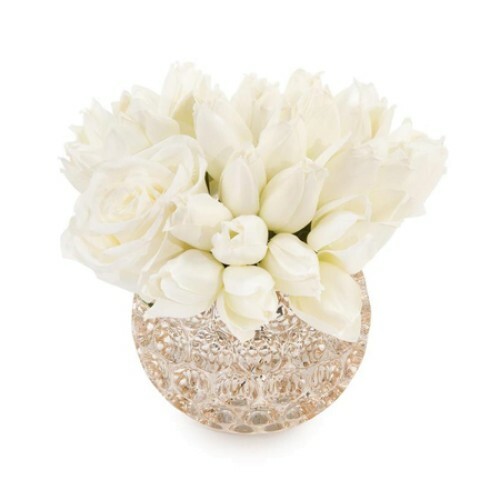 Each vase, which features a stepped base, is generously packed with a blend of snow-white roses, hydrangeas and lilies. Observe how the floral arrangements come in varying heights; the look is balanced but refrains from being flat. A posy of pretty flowers is a sweet way to accent your bedside table. The benefits aren’t only visual; you can also lift energy and set yourself up for a good day ahead by simply adding an arrangement to your space. Your bedroom is the last place you’ll find yourself at night and the first place you wake up to in the morning, so creating satisfying surroundings is key for a good mood. 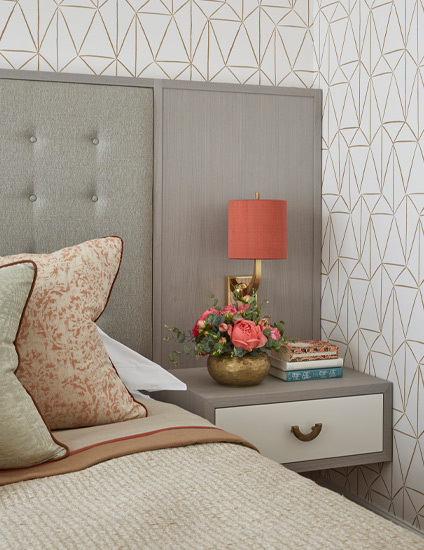 Stay clear of extra-large arrangements, as you’ll want to leave room for a bedside lamp, your favourite nighttime reads, and any other trinkets or essentials you want by your side. Helen Green Design opt for a neat array of pink-coral roses and peonies – accompanied by sprigs of eucalyptus – in a hammered golden vase. Take inspiration from the way that the arrangement references the wall lamp – cohesive styling guarantees to please. Follow Brendan Wong’s lead by using flowers with colour and texture to transform your living space. In this Sydney apartment, the Australian designer tops a coffee table with a round vase full of purple alliums. Their large heads bring scale and texture to the room, contrasting the sleek, smooth glass vase and table surrounding them. Texture is amplified again in the corner of the room, where a vase of tortured hazel – stacked on a set of nesting side tables – introduces a more rugged aesthetic. The organic vibe is mirrored by a few natural objets and a painting that evokes thoughts of the natural patterns found in stone. Try changing up your flower colour scheme to give your interior a new look every few weeks. This purple palette echoes the lilac seating, but emerald green or fuchsia pink blooms would work equally well. Often in interior design minimum effort can equal maximum impact. The notion is true for flowers and plants; sometimes the simplest addition delivers the best results. Leading London interior designer Laura Hammett is an artist at striking the perfect balance between dressed up and dressed down when styling coffee tables for her projects. Design is all about the details after all – quality, not quantity. 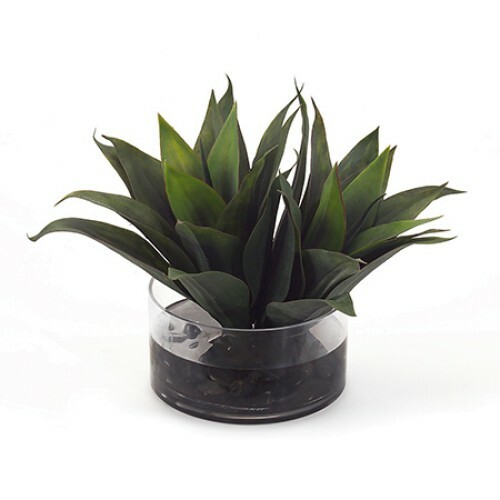 A single plant – set in an angular black vase – brings fresh colour and a hit of texture to this sleek, clean-lined arrangement of tabletop accents. 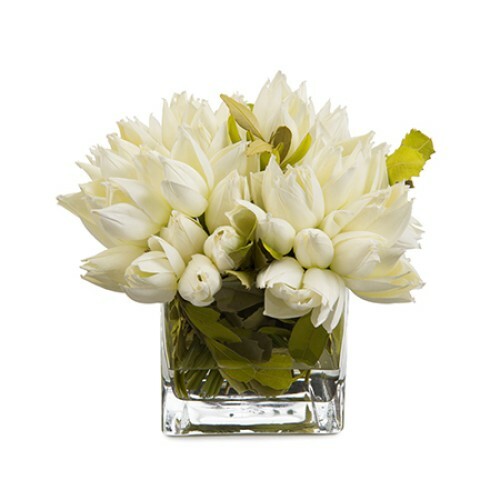 Try giving your favourite flower or plant a solo part on your coffee table for an effortlessly eye-catching effect. Thinking a little outside the box when it comes to where to place your floral displays is a playful way to go. Remember you’re not limited to tables and sideboards. Consider accenting floor space with potted plants or a mantelpiece or bare windowsill that needs a little something. 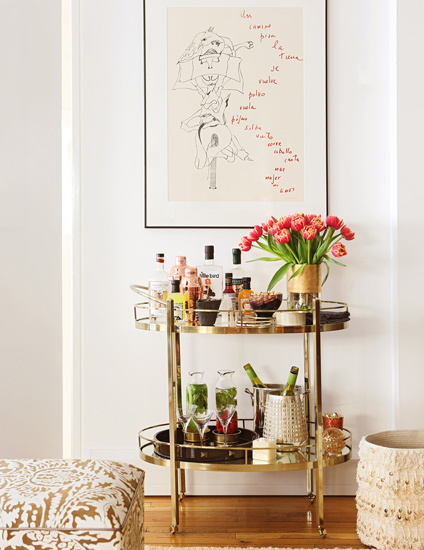 Natalia Miyar brings a fun touch to this space via a bright bunch of tulips, presented in a golden vase to complement the luxe drinks trolley. 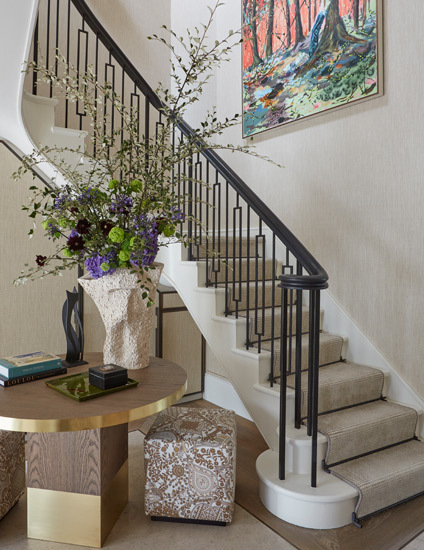 The interior designers at British studio Alexander James Interior Design give a lesson in the benefits of using the same arrangement more than once. Simple yet striking, the repeat technique is quick to execute and easy to switch up (rotate your arrangements around your interior) to keep your space feeling fresh. 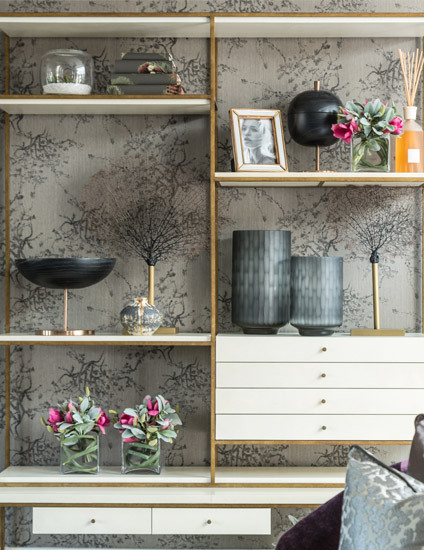 Three floral displays scatter pops of fuchsia pink across the upper and lower levels of this sleek shelf unit. Clear glass vases let the vibrancy of the flowers really shine, while – in a similar vein – smoky grey cylindrical vases are deliberately left empty to allow their colour to take focus. Experiment with floral shelf styling in your home by using identical flowers to capture the eye. Or try a few varying arrangements (think baby pink + taffy pink + deep magenta) to create a tonal effect.